Mobile Applications are becoming an integral part of not just modern enterprises but also of human existence and a huge part of this shift is due to the emergence of cloud computing. Cloud computing has allowed for the instantaneous utilization of applications which imparts tremendous agility to the enterprise. Accompanying such convenience are risk management challenges due to a lack of transparency, leading to security concerns that include applications. CSA released the MAST whitepaper which defines a framework for secure mobile application development, achieving privacy and security by design. Implementation of MAST will result in clearly articulated recommendations and best practices in the use of mobile applications. Mobile application security testing and vetting processes utilized through MAST involve both static and dynamic analyses to evaluate security issues of mobile applications for platforms such as Android, iOS and Windows. These processes cover permissions, exposed communications, potentially malicious functionalities, application collusions, obfuscations, excessive power consumptions and traditional software vulnerabilities. Testing and vetting processes will also cover internal communications such as debug flag and activities, as well as external communications such as Global Positioning System (GPS), Bluetooth, Near Field Communication (NFC) and Global System for Mobile communication (GSM) accesses. Apart from mobile application security testing and vetting, a mobile application security incident response plan will also be developed. The initiative will aim to create a safer cloud ecosystem for mobile applications by creating systematic approaches to application testing and vetting that helps integrate and introduce quality control and compliance to mobile application development and management. The initiative hopes that more research into mobile application security vetting and testing will help reduce the risk and security threats that organizations and individuals expose themselves to by using mobile applications. security to be included in the CSA STAR Program. Henry Hu, has over 20 years of experience in Cyber Security Industry, with expertise in security data analytic, malware analysis, digital forensic and audit, is one of the few who has expertise both in cyber security and big data area. With experience cross different projects including financial institution’s security framework and product integration, SOC installation and operation, database and ISO audit, secured Hadoop planning and installation, he is currently researching into rapid security data analytic and alternative data visualization for security data. Mr. Hu is current the CTO for Auriga Security, Inc, Board Member of Cloud Security Alliance Taiwan Chapter, and Chief Research Officer for OWASP Taiwan Chapter. Li Yao is the head of R&D Department at CEPREI Certification Body. He graduated from the University of Edinburgh with master’s degree in Signal Processing and Communication. He leads a team developed CSA C-STAR Assessment together with CSA experts. He has more than 10 years of information security and IT experience, helping several FortuneChina 500 enterprises architect cloud security and audited leading companies such as Huawei, Inspur, Pingan to improve their security management. He was awarded the 2015 Cloud Security Ninja Award by the Cloud Security Alliance for his contributions to cloud security research. He is a member of ISO CASCO WG45, a CCSK, CCSSP, CSACT, ITIL and ISO/IEC 27001 auditor, ISO 22301 auditor, ISO 9000 auditor. Please contact Mobile Application Security Testing (MAST) Working Group Leadership for more information. Want to contribute to the Mobile Application Security Testing (MAST) Working Group? 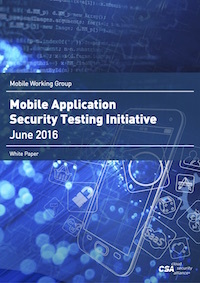 Which Mobile Application Security Testing (MAST) Working Group initiative are you most interested in? Your request to join Mobile Application Security Testing (MAST) has been recorded. Someone will be in touch with you soon with more instructions.